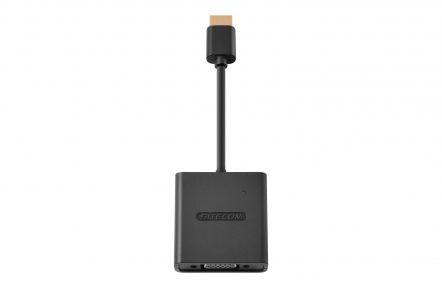 The CN-350 HDMI to VGA Adapter from Sitecom lets you connect your HDMI devices like a MacBook Pro, Chromebook or Windows notebook to a TV, monitor or projector that uses VGA. Watch video content from your MacBook Pro, Chromebook or Windows notebook on a large screen TV or home projector. To enjoy a first class home-cinema experience including audio, simply plug a 3.5 mm jack cable into the device where your content is on and connect it with your TV, soundbar or speakers. You can also use the HDMI to VGA Adapter to extend your notebook’s desktop to a larger screen and increase your productivity or mirror the content to let your audience see what you are seeing. The HDMI to VGA Adapter supports a maximum resolution of 1920 x 1080 pixels and provides a crystal-clear viewing experience on every screen. The adapter is fully Plug & Play out of the box. 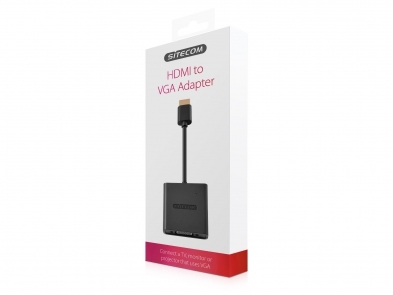 Simply plug the adapter into a free HDMI port on your device, no drivers needed. The adapter is compatible with all operating systems.